Small Jobs Landscaping provides customers with a variety of services to meet your landscaping needs. From supporting you to “Do It Yourself” to a fully serviced new construction, Small Jobs Landscaping has the solution for your “small” landscaping project. 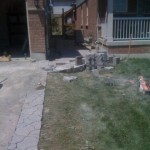 Small Jobs Landscaping also offers a variety of services to repair, redesign and maintain your landscaping. So many times we love our home, but the outside does not function well for us. 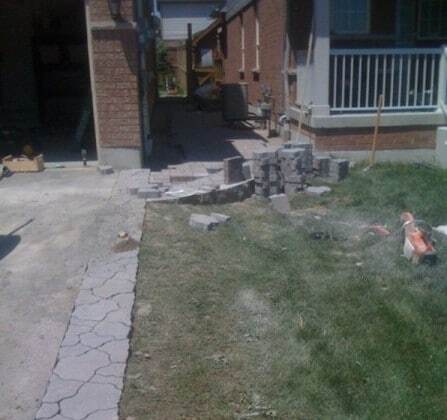 Either you move in to “builder grade” landscaping entailing some precast steps and plain patio slabs or you inherited landscaping from the previous owner that just does not work for you. Let Small Jobs Landscaping come in and find the solution that would work for you. Not all new construction involves concrete and stone. Often people enjoy their “hardscape” (concrete and stone), but feel it needs a little more. Simply adding a garden, either traditional or low maintenance, can add flare, colour and architectural interest to your current landscape. After years of enjoying your landscaping, you may find that it has become worn and dated. Pavers sink or heave, wall and steps shift or years of salt use have damaged the finish of your brick creating a worn out and often dangerous situation. You may think you can not afford a new landscaping project. Let Small Jobs Landscaping come in a find a solution to your problem through repairing and redesigning you landscaping to bring it back to life and give it an updated and fresh look. Not only can Small Jobs Landscaping save you money through repair and redesign, but it it is better for the environment with less waste and disposal. This service is also good for those that want to enhance the curb appeal of their home prior to a home sale. Let Small Jobs Landscaping help you sell your house fast. Many people love the look of a well constructed perennial garden, but don’t know how to design and maintain them. Let Small Jobs Landscaping come in and design and help maintain your perennial garden. Maybe you have an existing perennial garden that you feel has gotten out of control. Let Small Jobs Landscaping tame your wild perennial garden and let you fall in love with your garden gain. Small Jobs Landscaping can do year end garden clean ups, spring garden opening, mulching, other garden maintenance, as well as train you can maintain your own garden. Give us a call. Small Jobs Landscaping Lawn Maintenance division not only provides a professional maintenance service, but also serves the community to aid youth in securing a fair paying job and potentially an additional opportunity to regain traction in their own endeavours, managed by Marcus McPhee. Marcus’ journey in horticulture all started with grief, not his own, but others. As strong member of the horticulture team at a cemetery, he began to master the skills of lawn care and pleasing those who recently lost their loved ones. Doing this was complementary with completing his Bachelors of Science in Environmental Science and Plant Biology, eventually continuing with his Bachelor of Education. With over 7 years of lawn maintenance and general landscape experience and becoming a school teacher Marcus felt obligated to keep his passion alive with offering affordable maintenance to those who needed it most in the summer months. Yes, this meant putting on his work boots and working after school hours, but it’s a passion that is worth the effort. His first clients were both in situations that left them unable to maintain their own lawns in the Durham Region. He then started to gain more clientele through word of mouth which led to many other locals who needed similar assistance. Along side the founder of Small Jobs Landscaping, Marcus has a passion to aid those who need it most. This led to a decision to collaborate their like-minded business plans, to serve our community both socially and with a service based product. With training from the best in the business, we promise of offer quality services at a quality price. Give us a shot like we will give others! Have you ever taken on a project that you thought you could do but got stuck? Do you want to have the pride in your own work in a project but did not know where to start? Maybe you want more done then your budget can handle. Small Jobs Landscaping has a solution for you. Small Jobs Landscaping has a “Do It Yourrself” (D.I.Y.) Support Service which works with you, your skill level and your budget to get a quality, professional landscaping, while saving you money and giving you pride in your own work. Small Jobs Landscaping “D.I.Y.” Support Services can provide as much or as little support as you need. Whether it is to design your project or support in the construction we will be there to get you through the job in a professional manner. Small Jobs Landscaping “D.I.Y.” Support Service can also order, pick up and deliver your material as well as dispose of the waste all at competitive pricing.